Kenyan Animals - The Big 5! 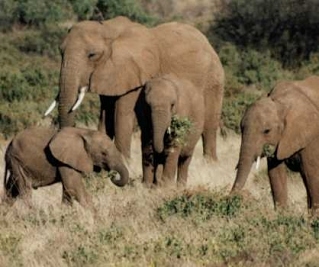 The most famous animals in Kenya are known as the Big 5. They are Lions, Leopards, Elephants, Buffalos, and Rhinos. Learn more about the Big 5 below! 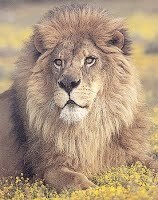 The Lion is the most famous animal in Kenya. During the day, they spend a lot of time resting in the shade. They are predators who hunt for their food at dusk or dawn. The female does most of the hunting. They live on the savannas of Kenya in groups called prides. 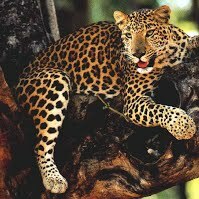 Most of the time, the leopard lives a solitary life. Their dark spots and brown coat make it hard for predators to find. They are awake during the night and live in rocky hills, high in tree branches, or thick woodland brushes. They hide their prey in tree tops so that other animals will not steal it. Leopards are the only big cats who do this! The elephant can live from 60 to 70 years. They eat a large amount of leaves and grasses each day. They live in large groups called herds. They roam across the savanna led by the herd's matriarch. Elephants flap their ears to keep cool. When they flap their ears and snort that means they are upset. They can communicate with each other over long distances. The buffalo has a bad temper! They are very heavy. 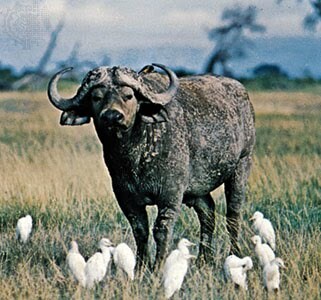 Buffalo use their dangerous horns to get rid of pests and predators. They can usually be found near water and on the savanna. Large groups gather on open grassland and smaller groups in the forest. They are also known to chase lions! 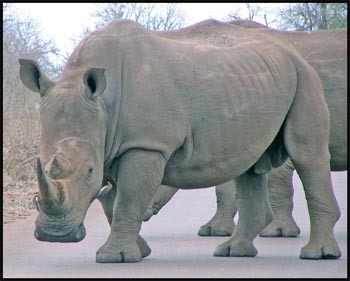 There are two species of rhinos, the black and the white. They are both very rare. They live alone or in pairs. They eat the leaves of trees and bushes. Rhinos have very bad eyesight, but an excellent sense of smell and hearing. They live from 35 to 40 years and weigh two tons! A baby rhino stays with its mother from 2 to 4 years.